1000 H2 V-TWIN 4-STROKE ENGINE WITH EFI: A 951cc, H2, liquid-cooled V-Twin EFI engine provides the efficiency advantages of four valves per cylinder with its Pentroof Hemispherical Combustion Chamber. It’s a combination that provides more complete combustion, which directly translates to more power, more efficiency and cleaner exhaust. DIGITAL POWER SPORT GAUGE: The Power Sport gauge packs one heck of an informational punch. The digital gauge features all the essential operation information indicators: RPMs. speedometer, trip mileage, gear indicator, digital clock and fuel indicator. MAXXIS BIGHORN TIRES WITH ALUMINUM RIMS: Excellent shock absorption, large shoulder lugs for added traction and a wide footprint make this tire a perfect match to all that power. Aluminum rims give it that finished look. 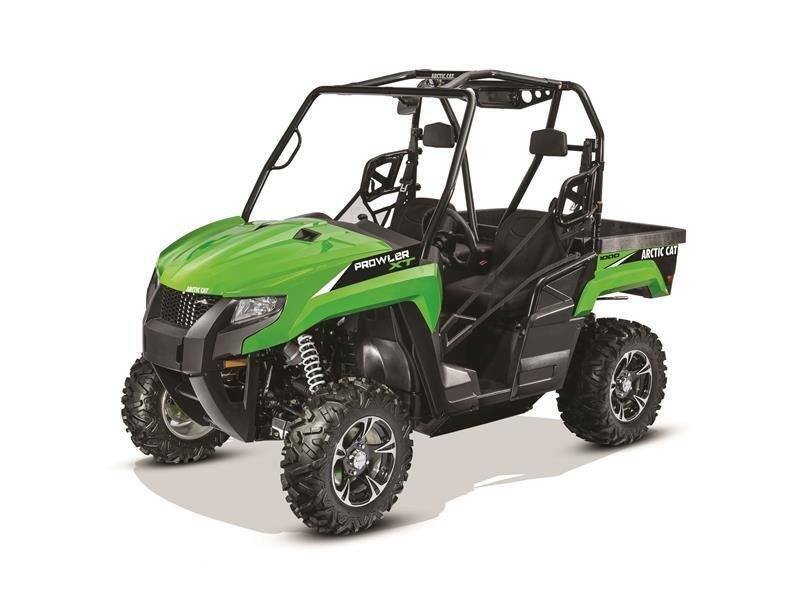 HIGH-QUALITY SURLYN® BODY PANELS: The Prowler XT™ uses super-tough Surlyn by DuPont™, a resilient resin-based material with a proven record, borrowed from Arctic Cat snowmobile technology. Surlyn requires no painting and is scratch-resistant. 600-LB.-CAPACITY TILTING REAR CARGO BOX: 600 pounds of pure get-it-done capacity. That’s what you get with the Prowler® rear cargo area. With the flick of a lever, the box tilts to dump your contents. You put it in there, let gravity take it out.